The Thorney Island Saddle Club is a Livery, Equestrian and riding Centre situated within the military Camp on Thorney Island in Emsworth. The Royal Artillery Equestrian Centre is a British Horse Society (BHS) approved Riding Centre situated in Baker Barracks, Thorney Island, Emsworth, Hants. The Centre was founded in the 1985 and gained charitable status in 2014. As a non-profit charity it is managed by a committee of military members and run by our friendly civilian management team. The Centre’s primary purpose is to promote the efficiency of the armed forces by the provision of equestrian courses, events and facilities to service personnel and their dependants and to promote relations with the wider community. The Centre is very proud of the support of its civilian membership and the local equestrian community who frequently visit for tuition, or to attend competitions. 52 good sized stables on the main yard. 40m x 20m indoor school with viewing gallery. 40m x 20m outdoor school. Car, Lorry and Trailer Parking Area. Both the Indoor and Outdoor School along with the Cross Country Course are available for hire. Contact RAECTI for prices. Before joining RAECTI, all prospective members are asked to complete a 30 minute assessment ride to determine their level of ability to determine an appropriate teaching class. Children must be 4 years and above. All tuition at RAECTI is provided by our friendly and qualified instructors. Our civilian instructors are BHS registered to ensure quality, suitability and progression. Lessons take place throughout the week and on Saturday. We welcome all levels of riders and have a range of excellent horses and ponies. Please contact RAECTI for more details. RAECTI has a number of spacious stables on the yard with a separate secure tack room. Our paddocks are fenced with good quality post and rail fencing and there is summer and winter turn out available. Please contact RAECTI for more details. The success of our equestrian centre depends on the strength of the team behind it and the talent, skills, experience and dedication of the individual team members. We recognised and value the importance of the poeple who make up our team and encourage our team members to continually develop their skills. The result is a highly motivated, dedicated and committed team who are proud to play their role in achieveing even greater success for our clients. Come and visit us here at RAECTI anytime. You will receive a warm welcome and we will be more than happy to show you around. We are here because we love what we do. With over 45 years equine experience including working at Penarth Stud and the Royal Military Academy Sandhurst Brunei Stables Jane is our Office Manager. Joining the RAECTI in Sep 18 Jane has built a fantastic rapport with all our liveries, staff, children and riders. Her passion and drive towards the care of our horses and ponies and working with the military and wider civilian community is second to none. Vicky joins our team with a wealth of equine experience. Watch this space for her full bio. With 30 years equine experience, Jo is a valued member of the team. With 3 horse of her own to loves to teach all ages and abilities. A motivated and enthusiastic instructor she knows how to bring out the best in all she teaches. Our newest member of the team, you would have thought Abi had been with us for years! Effortlessly slotting into her new role, Abi prides herself on the care of all our horses and ponies. Riding for many years she regularly competes with her beautiful Fresian, Olli. Abi is working towards her Stage 1. Gunner Same Dudley has joined us on attachment from 12th Regiment Royal Artillery. A great addition to our team Sam has all the characteristics we love to see - dedicated, friendly and fab with our horses, ponies and clients! He is invaluable to our team. A new member of staff will be joining us soon. Watch this space! RAECTI provides and maintains a safe and healthy working environment as required by law. There is a number of helmets available for newcomers although it is stressed that if you decide to join and ride on a regular basis, that appropriate kit is bought. Welcome to the RAECTI and we hope you enjoy pleasant and instructive riding. Please note that horse riding is a high risk sport and therefore riders do so entirely at their own risk. Check our Facebook page for up to date information on our shows and events. 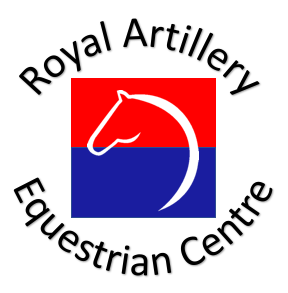 If you join, ride or compete at the Royal Artillery Equstrian Centre we may keep hold of your name, address, telephone number and email address. We will only use this to send you information relevant to the RAECTI and will not sell your data or pass it to anyone else. If you would rather not have these detail registered with us, you can still join but will not be sent a newsletter, schedules or event details/forms. Please also be aware that photographers attend our events and the images taken at these events are uploaded to their website to view and purchase. The images may also be uploaded to Facebook when sold for social media or used to promote the event. By riding (through lessons or group activities), entering or attending our events you are deemed to accept this. If however you wish not to have your photo taken please inform the organisers and the photographers on the day.